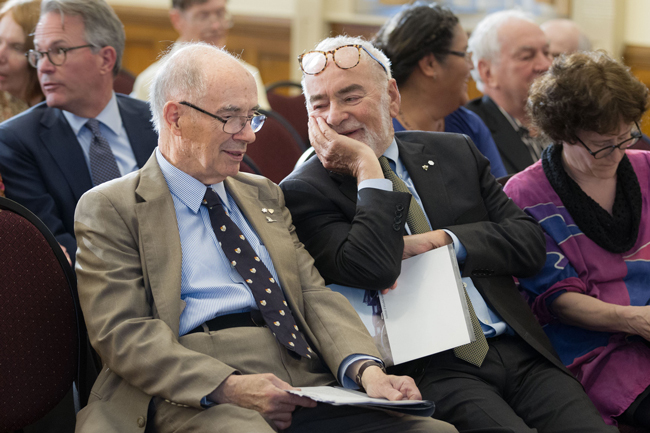 It was standing room only at a speech given by Desmond Morton, Professor emeritus, and the first head of the McGill Institute for the Study of Canada (MISC) at a recent celebration of his 80th birthday at the Faculty Club. Desmond Morton, Hiram Mills Emeritus Professor and Founding Director of the McGill Institute for the Study of Canada during the Sept. 14 event celebrating his 80th birthday. / Photo: Owen Egan – Joni Dufour. 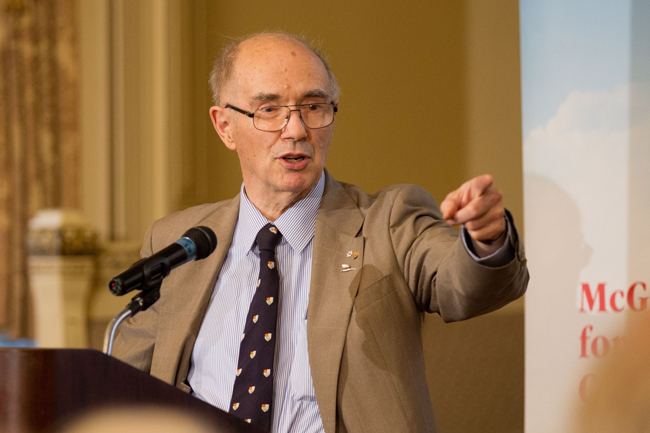 It was standing room only at a speech given by Desmond Morton, Professor emeritus, and the first head of the McGill Institute for the Study of Canada (MISC) at a celebration of his 80th birthday at the Faculty Club. 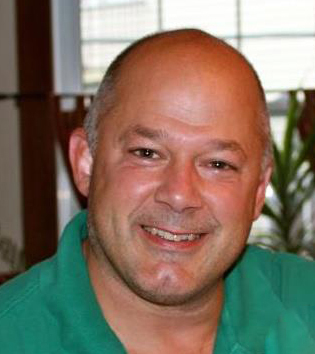 The subject of Morton’s presentation was “French Canada’s Impact in WW1” and made the case that French Canadian soldiers and officers made a much bigger impact on the British victory in WW1 than is widely known. The list of luminaries who took part in the celebration was long. Principal Suzanne Fortier; past Principal Bernard Shapiro; Provost Christopher Manfredi; Dean of Arts Antonia Maioni; founder of the McGill Institute for the Study of Canada Charles Bronfman; Professor emeritus Charles Taylor; Michael Goldbloom, Principal of Bishop’s University, and his mother, community activist Sheila Goldbloom; Jeff Chambers, son of former Principal Gretta Chambers; Terry Mosher (aka Aislin); Professors Irving Abella and Jack Granatstein of York University; Ed Broadbent, former head of the NDP; along with the interim head of MISC Elsbeth Heaman; and former heads of MISC Will Straw and Andrew Potter; documentary film makers Brian McKenna and Rick Blackburn; and many other members of the McGill-, Quebec-, and Canada-wide community attended. Elsbeth Heaman, interim head of MISC, spoke at the event. 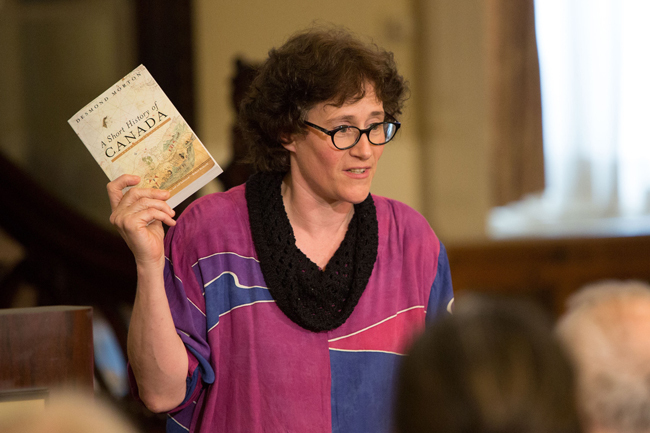 “We’ve been lucky to have [Des Morton] as a historian of Canada, and luckier still to have him at McGill, where he set an aspirational standard for Canadian Studies and public outreach,” she recently told the Reporter. /Photo: Owen Egan – Joni Dufour. 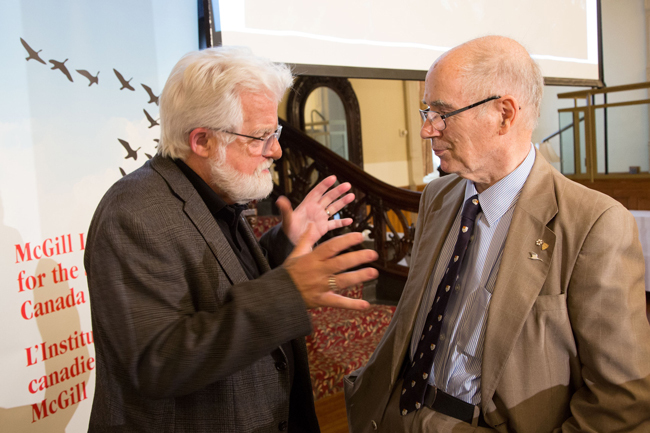 Des Morton (right) and political cartoonist Terry Mosher (aka Aislin) share stories. /Photo: Owen Egan – Joni Dufour. 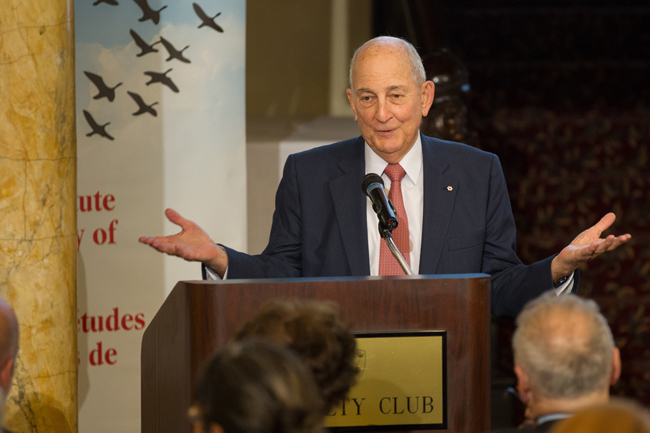 Charles Bronfman, businessman and philanthropist, at Thursday’s celebration. /Photo: Owen Egan – Joni Dufour. Des Morton (left) and York University professor Irving Abella. / Photo: Owen Egan – Joni Dufour.